Is it me, or does that owl look terribly smug? Yeah, probably just me. Really awesome comic so far, I can’t wait to see how it goes. Of course, owls shouldn’t be smiling in the first place. Very suspicious. Yesss. Smug owl is one of my favorites. Thank you for the plug! You’re a sweetheart. PS I VOTED. Everyone else should vote too! Of course you’re welcome, my dear! ;3 Thank you so much for voting! Shouldn’t your “Velkommen” be “Hilsen”? My nynorsk is rusty but I think velkommen might be German. Hey Damar! You might be right, I don’t know a lick of Norwegian and have relied on always dubious internet translations. I think “hilsen,” or a word similar to it, was one of the options when I looked for “welcome” translated, but then “velkommen” was usually listed as well. I looked for German too, just for curiosity’s sake, and their welcome is usually something like “Willkommen.” Very similar, that’s for sure, and probably pronounced the same. I’m not a linguist, so I can’t say much about the root source of languages, etc. The primary reason I picked velkommen was because its meaning was obvious. Welcome! If any Norwegians/Scandinavians out there are reading this and shaking their heads at my own stupidity, I would love more information or an explained correction. Languages are pretty awesome to learn about. ;3 Thank you! I speak Norwegian and I can say with certainty that velkommen is Norwegian for welcome. Though it’s very similar to the german willkommen. I came here from Cealdian, too. Within the first few pages, I knew I was going to like this comic. Great job so far and I can’t wait to see more! 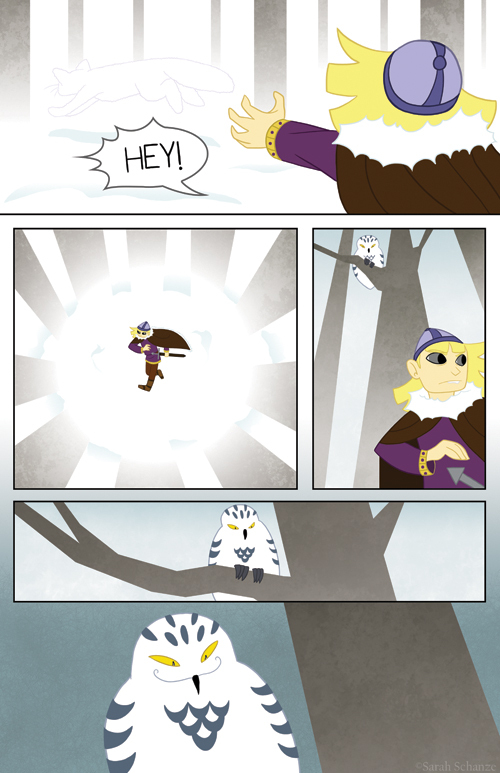 Evil Hedwig! Harry Potter had better watch his back! Came here from Cealdian, read the archives and fell in love with the art and how whimsical it feels – light, fresh, airy, and the style reminds me a bit of Samurai Jack (a favourite of mine). Now in my must-read bookmarks and being recommended to my friends! Also that owl? Is the best owl. Hello! I have ventured from Cealdian as well. I look forward to reading s’more from you! Thanks Diem-fish! I’m glad you enjoy everything so far! Someday I might have to pick up that book, you’re not the first to mention it after I talk about TMK or Norse mythology. Thanks again! Also came from Cealdian. I like the style of the comic. Good comic to break up the usual flow of fantasy/gaming comics I read with a little norse-ness. Thanks! Thank you Justin! I’m still surprised there aren’t more Norse-inspired storylines/comics. It’s such a wealth of ideas! Evil owl is evil…reminds me of the old adage “Never trust a smiling cat.” But a smiling owl makes it about ten times worse, I think. i found you on twc, faved and vote too! simply awesome art!